fermentazione (I) Your browser does not support any audio element. fermentation (GB) Your browser does not support any audio element. The term for alcoholic fermentation at the winemaking previously referred to the apparent "cooking" or "foaming" in the grape, Fermentation is the microbial degradation of organic matter without the involvement of external electron acceptors such as oxygen ( anaerobically ) understood for the purpose of energy production. Degradation of organic substances can, however, basically also with the inclusion of oxygen ( aerobic ) occur. For example, at the acetic fermentation Oxygen consumes, so this is in the scientific sense as described above no fermentation. 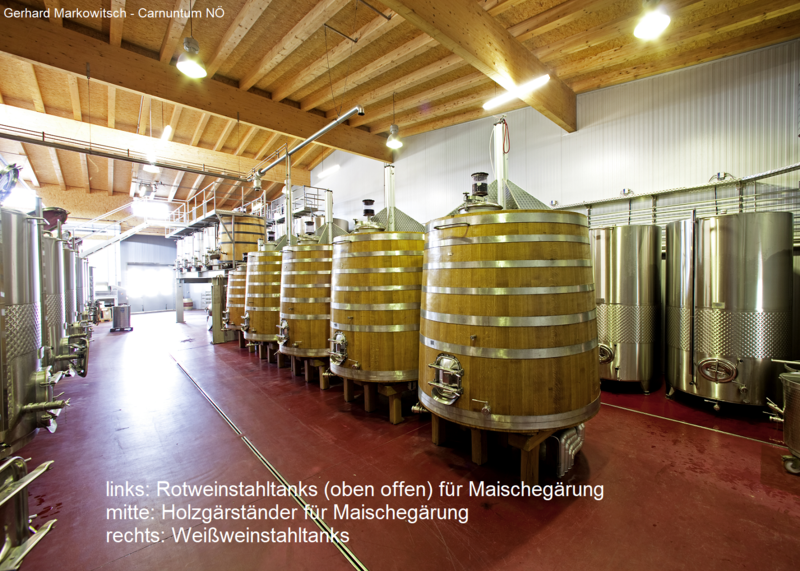 The term fermentation however, in German is an umbrella term for aerobic and anaerobic processes. This often leads to confusion because in other languages "fermentation" is used for alcoholic fermentation or there is no separate term for it. The process has long been considered a natural decay. The influence of air (even when the oxygen was already discovered) was ignored. Therefore, the processes in the conversion of must into wine, of wort in beer and of wine in vinegar called fermentation. The participation of microorganisms was by Louis Pasteur (1822-1895) recognized in 1857. Fermentation occurs everywhere spontaneous where at an optimum temperature between 18 and 27 ° C yeast come into contact with aqueous sugar solutions. As a rule these are fruit juices, but other substances dissolved or added in water, such as cereals (barley, wheat, maize, rice) can also be used in the production of beer or other sugary substances such as potatoes. The fermentation at Wine today is usually temperature controlled in stainless steel tanks, which is done in larger companies by means of computer use. But also one barrel fermentation is used by many producers. For an optimal fermentation is previously a corresponding must treatment Fermentation is the enzymatic degradation of organic matter in anaerobic Environment, that is in the absence of oxygen, In the presence of higher concentration glucose (Grape sugar) in the grape but also in the presence of oxygen, ie in aerobic environment alcohol be formed. This is also known as the English biochemist Herbert Grace Crabtree Crabtree effect (or Pasteur effect). An aerobic environment with oxidative Processes is also in the production of certain wines such as port wine and sherry common. The yeasts play a crucial role in fermentation. After this Press multiply in the grape Rapidly through sprouting and division. Towards the end, 50 to 200 billion yeast cells are contained per liter of wine. The biochemical processes are contained in the yeasts enzymes controlled; for the fermentation is the Zymase complex responsible. Natural or wild yeast are to a large extent in the vineyard and elsewhere (air) available and get with the grapes in the cellar. Through this, the fermentation can also be triggered completely independently, which used to be the usual practice. In this case one speaks of spontaneous fermentation, However, this is far harder to control, but is becoming increasingly associated with Organic viticulture in the production of Biowein prefers. In the grapes or grape must, the simple sugars are at the beginning of the fermentation glucose and fructose approximately in equal parts. You will be 90% in ethanol and carbon dioxide converted in the ratio 51:49, whereby this happens faster with the glucose. Two molecules of ethanol and carbon dioxide are formed from one molecule of fructose or glucose. As by-products arise aldehydes. ester. glycerin. methanol. Succinic acid. acetic acid. lactic acid. sulphurous acid. citric acid and higher alcohols or. fusel oil, as well as energy in the form of heat. Therefore, the actual alcohol yield (ethanol) is not 51% but only 47 to 48%. As a rule of thumb, 10 g sugar per 1,000 g must yield 0.66% vol alcohol. The carbon dioxide gives about fifty times the volume of the must and collects at the bottom because it is heavier than air (relative density 1.52). Therefore, there is danger of suffocation in the fermentation cellar and, despite the knowledge of this fact, some deaths happen every year. The former often common candles sample with which the oxygen content of the air should be checked is unsuitable and life-threatening. Today, the carbon dioxide is sucked through exhausters (ventilators) and led into the open or used in large wineries. To a small extent, the carbon dioxide is bound in the wine, thereby creating real carbonic acid, In the production of sparkling wine ( sparkling wine. champagne ) is as fine as possible bubbles or high Perlfähigkeit primary goal. An important criterion is the fermentation temperature . At higher temperatures the fermentation is stormy, at lower temperatures it is slow. The optimal temperature for the propagation of yeasts is 25 ° Celsius. The "right" fermentation temperature depends on the desired type of wine. The warmer the fermented, the more flavors and alcohol are lost, but more glycerin educated. It also ensures a safe fermentation with the result of a dry wine. It should be noted that in larger containers the must warms more (600 liter container to 22 ° C, 7,000 liter container to 33 ° C). As preparation, the pre-clarified must is brought to a starting temperature of about 15 to 18 ° Celsius. Of one especially when White wine usual cold fermentation Special cold fermentation yeasts are used at temperatures of 10 to 15 ° Celsius. At the red wine usual maceration higher temperatures are required, which are between 25 and 30 ° Celsius. 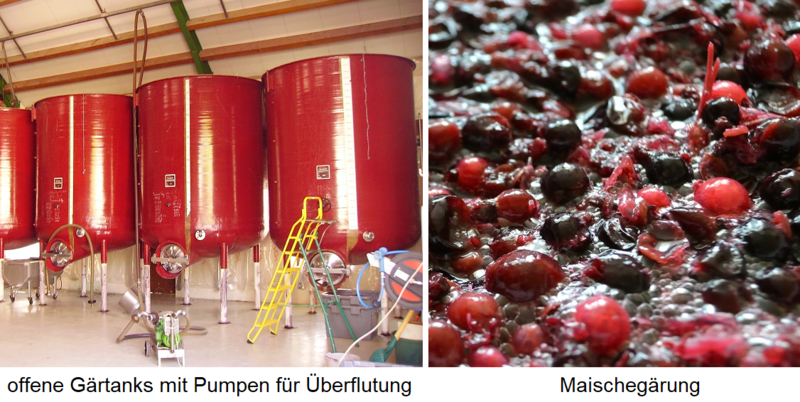 At too high fermentation temperatures from 35 ° Celsius can it to Versieden come, what the vinegar sting and spoil the wine. To maintain the desired temperatures, cooling is required. This is often used today with cool and heatable fermenters automatically controlled by computer. These are mostly out stainless steel or ceramics. The fermentation period is between eight days to six weeks, depending on temperature, yeast and wine type. For special wines such. B. Vin Santo, this can take months. For an optimal fermentation process will also Gäraktivatoren added. The fermentation ends when the sugar is almost completely transformed, then the yeasts have no more food. The second major reason is when the conditions have reached a hostile status for the yeasts, that is, for example, the alcohol content. A complete fermentation of sugar is not possible in a natural way, it remains even with completely dry wines developed a certain amount of residual sugar in the wine. The dead yeasts combine with other substances than Trub at the bottom of the fermentation tank. Now it must be decided whether the most common in red wine preparation malolactic fermentation (BSA = malolactic fermentation) takes place or should be approved. If the acid in the wine is to be retained (which may be useful in warmer areas), this is prevented by removing the necessary proteins. The question of whether acid should be added or broken down, there is ever growing zone or country-specific different legal provisions (see under leavening and deacidification ). After fermentation is completed, the wine is left on the yeast for some time to give it more flavor and fullness, as well as carbonation. This is called as lees (French sur lie = camps on the lees or. whole yeast ). This page was last modified at 29 March 2019 at 10:57.